12x18 - Reflective Rust-Free Heavy Gauge Aluminum Historic Route 66 Sign. 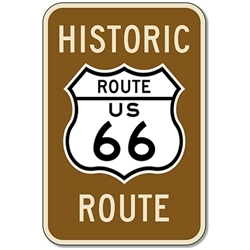 U.S. Route 66 (US 66 or Route 66), also known as the Will Rogers Highway and colloquially known as the Main Street of America or the Mother Road, was one of the original highways within the U.S. Highway System. Route 66 was established on November 11, 1926, with road signs like this one erected the following year in 1927. The highway, which became one of the most famous roads in America. DOUBLE the working life of your Historic Route 66 by adding 3M Protective Overlay Film (POF)! 3M’s high-tech POF protects sign faces against fading caused by the sun and harsh weather—and makes graffiti defacement damage easy to clear away without harsh abrasives.